The Wiggles have a new line-up. They have a new album, which came out last month, an accompanying DVD due to be released next week, and are currently ‘Taking Off’ on their first tour as a freshly-pressed foursome. It looks like full steam ahead for the Australian ‘kid rock‘ sensation. But for me – someone whose age can be counted in decades, not on one hand – it is the end of an era. The Wiggles. You either know them intimately, every riff of ‘Hot Potato’ seared into the grey matter of your brain, or you think I am talking about a collection of caterpillars. These guys don’t inspire half-measures. 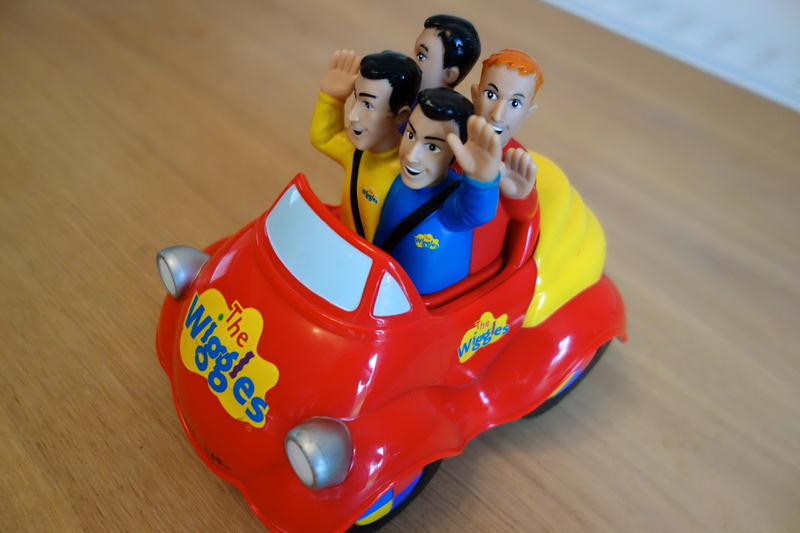 A children’s music group from Sydney, Australia, the Wiggles have developed a cult-like following among the under-four set since their inception 22 years ago. The idea of a children’s music group with a worldwide impact is amazing in and of itself. The fact that this particular quartet hails from Down Under is even more so: Australia is a continent hardly known for its musical exports. And yet, thanks to the Wiggles, my American/British kids can croon ‘beauty mate!’ with the best of them. The ‘Big Red Car’ first rolled into our house in 2008, a chance DVD that captivated my then 13-month-old son like a snake charm. It took only one spin of the disc before the ‘Gulls’, as Leo referred to them, and their cast of lovably bizarre characters became a go-to for just about everything. They were a soother: crying toddler quiets to the lilt of ‘Rock-a-Bye Your Bear’. They were a transitional object: scared toddler dashes into daycare as soon as he notices the stuffed Dorothy the Dinosaur in the toy chest. They were a potty-training incentive: toddler still pooing in his pants conquers the toilet with bribes of Captain Feathersword underwear. The Wiggles obsession was not a passing fad for us. Small children have small attention spans, but the blue, yellow, red and purple ‘skivvies’ of these middle-aged men managed somehow to withstand the test of time. Literally, for years, Leo lived a Wiggle-themed life: birthday cake decals were repeatedly shipped in from overseas. His older brother was also pulled into the whirlpool, sheepishly asking to come along to the concerts even after he claimed he was ‘too old’ to like them. And now Leo’s two younger siblings have discovered the embarrassingly large discography I had hidden away in the spare room, despite orders from my husband to burn the lot. I couldn’t get rid of the DVDs, you see, even after Leo had moved on. I couldn’t get rid of them because I hadn’t moved on. By the time Leo was ready to hang up his Henry the Octopus sunhat, there were two more children on the way and, unlike my husband, I didn’t want a Wiggles-free toddlerhood for them. My dirty little secret is that I like the Wiggles, I really do. I know all of the songs. I think they are clever and catchy and I actually considered the live show I took my older sons to a few months after the twins were born to be my first post-baby ‘gig’. Songs for kids that don’t grate on adults, is it possible? Like all music, this genre is as subjective as the next. But children’s music can be assessed for other qualities too, dare I say educational value. The messages here are all positive, as you would expect: pre-K basics (‘I Climb Ten Stairs’), fitness (‘Getting Strong!’), healthy eating (‘Fruit Salad’), manners (‘Sorry Again’). The approach, though, is quirky – quirkier than Barney, quirkier than Raffi – and unsentimental. This is why it works so well. Meeting foreigners, for example, is explored through the lens of aliens coming to Earth, introducing themselves to the cows because they don’t know what a human face looks like: ‘Zee zank zow means “Let’s be friends”. Zadda zup zung means “How do you do?”. Zapper zucker zulu, “It’s a pleasure to meet you”. Zender zuper zippee is “Whoopee do!”.’ Weird, right? But oddly compelling. The intersection of different cultures is a recurring theme for the band, which is and is not surprising. Australia is a very long way away from, basically, everywhere and the notion of forging links with the rest of the world is felt strongly in the oeuvre. That being said, the Wiggles themselves are Aussie through and through, a cultural artifact of modern-day Oz. Many of the songs, in this way, reflect local concerns: the importance of protection against the sun, the indigenous wildlife. And many embrace local heroes. You can ‘Do the Owl’ with the late Steve Irwin and be a ‘Monkey Man’ with the honorary pink Wiggle, Kylie Minogue. I have spent a lot of time in Australia. I love that my children have a tuneful window into its heart and soul. For this reason, among others, I do more than merely tolerate the Wiggles. At one point, I even joined the fan club…on behalf of my son, of course. Being a fan, though, comes at an emotional cost. When three of the group’s founders announced their retirement last year, it hit hard. Bands can power on after the loss of members, to be sure. But for those of us who grew up as parents with Anthony, Greg/Sam, Murray and Jeff, things will not be the same. Each of their idiosyncratic personalities contributed to the soundtrack of my early experience of motherhood. The ‘new’ Wiggles will continue in the same vein as their predecessors, I imagine, entertaining millions of pre-schoolers as they did before. The formula is probably foolproof enough by now to survive the three-quarter turnover of personnel. For this mom, however, the knowledge that my own kids will never wake Jeff up again means there is a real sense in which the ‘Wiggly Party’ is over. I only have on CD and you’re right that it doesn’t inspire half measures. I love how cross cultural your kids are!